Tropical Plant Concepts guarantees weekly plant maintenance by fully-trained and dependable plant technicians. In the event that a plant may fail to retain a healthy state due to the fault of our maintenance, it will promptly be replaced at no charge (aging of plants is excluded). Your clients will be consistently delighted by the tropical plants in your office that are lush and thriving with life due to the combination of good old fashioned care by our fully-trained technicians. Keeping living plants looking healthy and vibrant consistently is both a science and an art. Are you satisfied with their current maintenance? One of the most important parts of your interior tropical plant purchase is to ensure that your investment stays healthy and attractive. With our service-oriented philosophy, you can stop worrying about your plants. Our goal is excellence in every case. We take care of everything for you so you can get on with your business and give your clients the attention they deserve. Tropical Plant Concepts, Inc. guarantees weekly plant maintenance by fully-trained and dependable plant technicians. 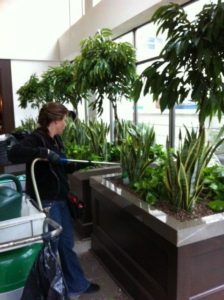 We inspect plants regularly for infestation and provide treatment if needed. Any plant that dies or fails to retain a healthy state due to the fault of our maintenance, will promptly be replaced at no charge (aging of plants is excluded). Our clients are consistently delighted by plants that are lovely, lush and thriving due to the combination of good old fashioned care by our technicians.